Attending authors known at publication include Special Guests of the Convention Raymond E. Feist (The Riftwar Saga), Gregg Hurwitz (Tell No Lies), Caitlin R. Kiernan (The drowning girl), Mike Mignola (Hellboy), Veronica Roth (Divergent series), and artist John Picacio. Other authors who can be found at panels, signings, and otherwise participating in the convention Jim Butcher, Christina Lauren, Deborah Harkness, Jonathan Maberry, Marjorie Liu, Patrick Rothfuss, Kevin Dilmore, David George, Amber Benson, Chris Marie Green, Rachel Caine, Tonya Hurley, Scott Westerfeld, S.J. Harper, Lev Grossman, and George R.R. Martin. Not to mention Kevin Smith and Jason Mewes and Jay and Silent Bob’s Blueprints for Destroying Everything. Plus 125,000-odd fans and more pop culture than you can imagine! Mysterious Galaxy will have books by many of the above authors in Booth 1119, along with special goodies from publishing partners Penguin Group and Simon & Schuster. You can also find us in publisher booths in the Exhibit Hall, and of course upstairs supporting many author signings in the convention’s autograph area! For more information, please check the Comic-Con site here. The signing schedule for our booth (# 1119) can be found at the bottom of this page. The BOOK BUSTERS MIDDLE READER BOOK CLUB (ages 12+) will discuss Father Gaetano's puppet catechism by Mike Mignola & Christopher Golden. Fans of author and artist Brom, whose works include The Child Thief, a gritty, nightmarish retelling of the Peter Pan myth, are invited to join the author in celebrating Krampus Night a bit early at MGRB. Krampus, The Yule Lord, is a tale of revenge between Krampus (the Germanic alpine trickster demon who punishes the wicked) and Santa Claus, set in rural West Virginia, one of Brom’s many homes. Guest hosted by local artist and author Mike Mignola. emphases as our books: mystery, science fiction, fantasy, and horror. We will also spotlight films that were adapted from books and other printed media. After screening the film, we’ll host a lively discussion and announce the next club pick. The Film Club is free to join and everyone is welcome to attend. Our first featured film will be Hellboy, based on the character created by our very special guest Mike Mignola. If you haven’t yet read the Hellboy series, we encourage you to pay a visit to our friends at The Comic Bug and pick up a few of the graphic novels. And while you’re here, don’t forget to grab a copy of Mike’s latest novel, Joe Golem and the drowning city. 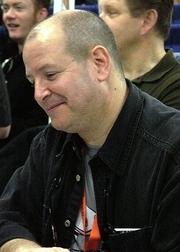 Best known for his creation of the character Hellboy, Eisner award-winning illustrator and writer Mike Mignola began his career doing spot illustrations in The Comic Reader. Inspired at the early age of 13 by reading Bram Stoker’s Dracula, Mignola never lost his fascination with ghosts, ghouls and all things supernatural. Since then Mignola has spread his sinister artwork across different genres and mediums including creating award-winning comic books and working as a production designer for Disney’s Atlantis and a visual consultant for Guillermo del Toro. Joe Golem and the drowning city reunites Mignola with award-winning author Christopher Golden for another supernatural thrill ride in this beautifully illustrated novel. A limited number of bookplates signed by Chris will be available. Mike Mignola is an American born comic book artist and writer, famous for creating the Hellboy universe for Dark Horse Comics. He has worked on other projects and collaborations, including The Amazing Screw-on Head and Atlantis: the lost empire. His style was described as "German expressionism meets Jack Kirby" by Alan Moore in 1997. Mignola has been the recipient of numerous awards for his art, writing and reputation, while his Hellboy comics have been adapted into successful films by Guillermo del Toro. Mike Mignola is currently considered a "single author." If one or more works are by a distinct, homonymous authors, go ahead and split the author. Mike Mignola is composed of 5 names. You can examine and separate out names.